When we left our hero, he’d travelled to Seattle, spent four hours in a line to get his bib and book vandalised by The Onion and become one of the last people to watch Dawn of the Planet of the Apes in the cinema. When I was training for my first marathon, I was given some advice for the final days before a race – “Don’t stand when you can lean. Don’t lean when you can sit. Don’t sit when you can lie down.” Basically, you want to rest as much as possible for a couple of days before the race. So, spending the Friday before a race standing in a queue and the Saturday morning wandering aimlessly around the Seattle waterfront was not the best way to prepare for race day. Saturday started with us tracking down breakfast at Le Panier – A Very French Bakery near Pike Place Market. It was recommended to us by one of our fellow marathon runners (a Saturday runner whose marathon bib number was 1!) and proved a perfect place for breakfast. The apricot croissant and pain au chocolat I had were both delicious, the bread looked and smelled equally good and the prices were excellent. If you’re in Seattle, it’s definitely worth sampling their wares although I’d recommend getting there early, it’s a popular place and I don’t know how often they restock during the day. After breakfast we walked down to the waterfront and wandered around for a bit. The original plan was to go and see some more movies so we were really just killing time. In the end, we decided that we’d skip the movies and just rest in the hotel. We did head back out to the Icon Grill again (after I’d done some writing), this time for brunch. I was going to spend the rest of the afternoon writing but I switched to reading Cherie Priest’s Maplecroft and I was enjoying it so much I didn’t stop until I’d finished which didn’t leave much time for writing. “Dinner” was a bagel from the Seattle Bagel Bakery (purchased in Pike Place Market earlier that day) and a hotel scone that was actually surprisingly good. Then it was time for more reading and an attempt at sleep. The marathon start time was relatively late, 9am, but Carnation, where the race was happening, is a good half hour outside Seattle and I wanted plenty of time to get there so alarms were set for the ungodly hour of 5:15. Of course, I was awake anyway (thanks Captain Insomnia) but still, it’s good to have a couple of backup plans. To avoid the hassle of renting a car (and paying stupidly high overnight parking charges) we decided to take a cab to the race. Things got off to a shaky start as the driver didn’t know where Carnation was but after we wrestled with his satellite navigation system into submission we managed to get heading in the right direction. Thankfully, I’d printed out the Google Maps directions as well so I was able to make sure we were on track and the ETA display on the GPS held calm the pre-race-will-we-get-there-in-time-to-get-to-the-porta-potties nerves. We got to the race about 8:15 and having arranged to ring our driver, BeeBee, if we needed to be picked up later, we walked over to the start line and got ready to race. There were three races taking place, a 10km, half-marathon and marathon. The courses overlapped a fair amount so the marathon started first with the half and 10k races following at thirty minute intervals. The marathon field was actually very small, just under 200 finishers in the end so although the opening stages were fairly narrow it wasn’t crowded and there was none of the jostling for position you get at some of the bigger races. The race was run through Tolt MacDonald park and it was a really beautiful route. The first 10k or so was in the open and given that the temperature was climbing towards 30 degrees, it was a little bit warm. But we were soon running under trees and the majority of the race took place in the shade. It wasn’t until the last couple of kilometres that we came back into the sun and by then it was getting uncomfortably warm. I was very glad not to have had to run in the heat for the whole race. My goal was to beat my previous best time of 4:18:25, preferably by breaking the psychologically significant but otherwise completely arbitrary 4:15 “barrier”. In the BMO Marathon, I went out too quickly and did a 2 hour first half but then 2:18 for the second half, missing a new personal best by 3 seconds. This time, I made a conscious effort not to go out too fast. I felt pretty good and had to slow myself down a few times but by 15km my legs were feeling a bit sore and it became a lot easier to control my pace. As part of the Blerch theme, we’d been promised that the aid stations along the route would be serving Nutella sandwiches and birthday cake. Not ideal race nutrition, at least for the marathoners, but a nice touch anyway. But as I approached the first big aid station, it became clear that they’d gone to a lot more trouble than just providing Blerch approved snacks. Most of the aid stations had a couch and were manned by at least one Blerch. And as the runners got closer, the Blerch started heckling. One of the aid stations even had a sasquatch hiding in the trees. It was all very cool (and funny) and added a whole new dimension to the aid stations. 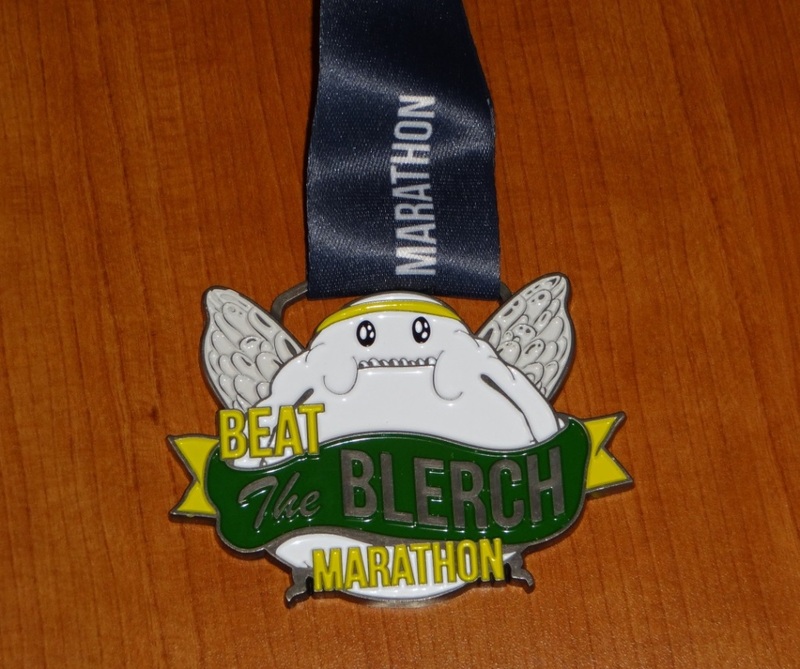 I’d definitely like to see the Blerch at other races. I hit the halfway point of the race in about 2:02 which was a pretty good pace, a little quicker than I’d planned but by then my legs had eased up and I’d settled into a good rhythm. The course was winding through the forest and over bridges and I was really enjoying myself. Although the route did have a fair amount of elevation in it, the slopes were so gradual they weren’t really noticeable – especially compared to the hills I run during training. After a while we passed the half-marathon turn around, the trails got a lot quieter and everyone racing was a marathoner. And then the gunfire started. At least, that’s what I assumed it was. It was way off down in the valley but my warped mind did picture someone picking off runners for being too slow. Given the small field, everyone became pretty spread out (or maybe it was the marksman thinning the crowd). I kept up a decent pace though, passing some of the other runners (always encouraging). The route was an “out and back” so I got to see other runners on their way towards the finish line and encourage the people behind me once I’d turned around myself. As the race wore on, I got more and more tired and the aid station couches looked ever more tempting. By the 35km mark I was really having to push myself but I’d kept up with my nutrition and I was keeping under 4:15 pace. I could see that I was on track to break the 4:15 barrier which helped a lot with my motivation. 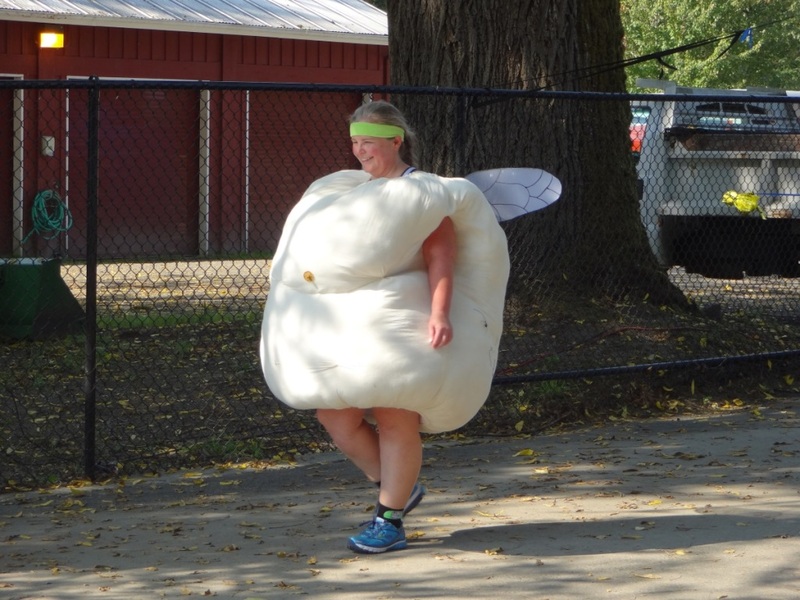 That was also about the time I reached the final aid station and was greeted by one of the Blerch (Blerches? Blerchi?) who then proceeded to run alongside me, encouraging me to take a rest and eat some cake. It brought a smile to my face but it was very tempting. But, I persevered and pushed on, finishing the race in the blazing sun and recording a time of 4:13:50 – 4 minutes 35 seconds under my previous best time. Happy but tired, I wobbled over to the shade with my medal and sat down for half an hour or so before walking very slowly back out to the main road, ready for BB to pick us up to take us back into Seattle. For those of you interested in such things, here’s the data from my Garmin. The shaded area is elevation, blue is pace, red is heart rate (click for a readable version). Despite being so tired, it’s always hard to sleep after a race. Something to do with endolphins I guess. So, after a few peanuts and some Coke Zero (both good post-race nutrition I’m sure), I did some writing. Over 2,000 words in fact. We ate dinner at The Cheesecake Factory. For those of you who’ve never been, there are two things you need to know. First, the menu is huge and covers pretty much any style of food you’ll likely to want. And second, they cram a lot of calories into every dish. Even my harmless sounding orange chicken and rice came in at 1,790 calories. Pretty much a day’s worth of calories for me. But, it was race day so I invoked the post-race calorie waiver and tucked in. Although I did save some space for the cheesecake. Post-Cheescake Factory time was spent doing a bit more writing and getting started on Chris Pourteau’s Shadows Burned In. Our train back to Vancouver didn’t leave until 6:50pm on Monday so after a delicious breakfast at Lola (another good place to visit if you’re ever in Seattle but again, it gets busy) we spent the morning at the Seattle Aquarium which was fairly small but enjoyable (and blessedly quiet). Then we headed back to the cinema to watch Liam Neeson in A Walk Among the Tombstones. 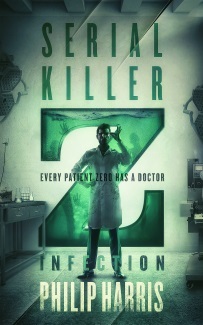 It was not quite the film I was expecting – in a good way. From the trailer I’d seen I thought it was another film along the same lines as Taken but it took a different, darker, direction which I enjoyed. Another taxi ride got us back to the King Street Station in time to get good seats for the return journey to Vancouver and our own bed. All in all, an excellent trip. 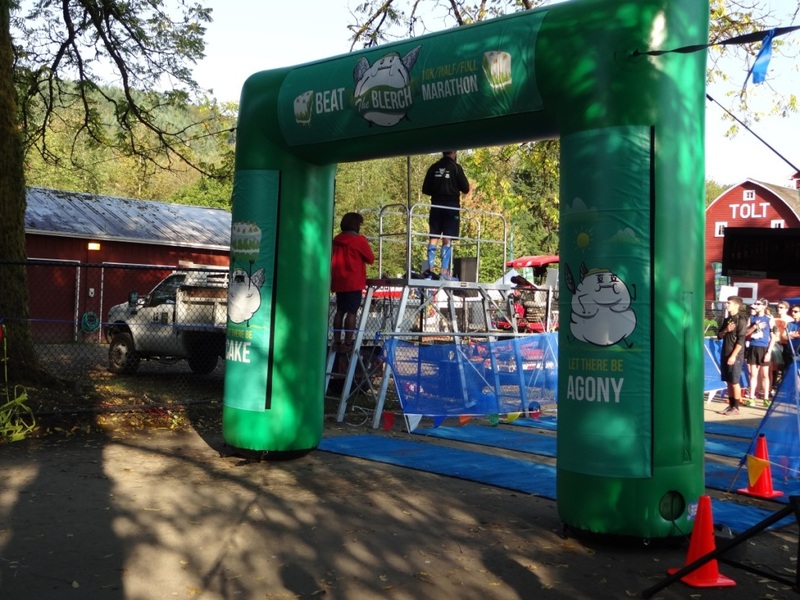 The race was probably my favourite marathon so far – it was well organised, a great course and the thought of the Blerch and their couch equipped aid stations still brings a smile to my face. Sadly, as I was writing this, I heard that one of the runners in Sunday’s half marathon, Evan Sebenius, collapsed and died shortly before finishing the race. My heart goes out to his family at this difficult time. A memorial run to “Run Evan In” will take place on November 2nd and a fund has been set up for the family. The money raised will be used to finish an orchard and vineyard Evan and his brothers were working on. Food from the orchard will be distributed to local food banks.